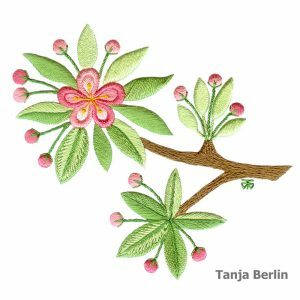 The Apple Blossoms are a 2-sided hand embroidery technique. 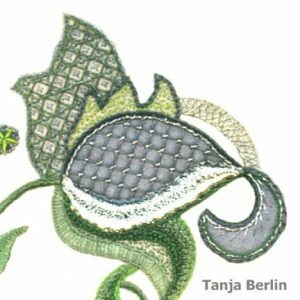 The design is worked in surface embroidery stitches on a taffeta fabric using DMC No. 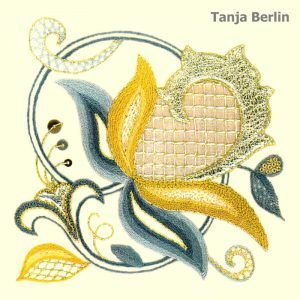 8 Perle cotton thread. 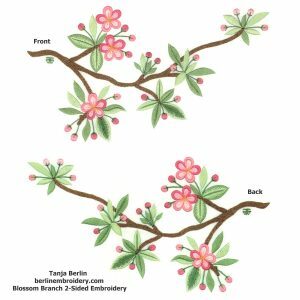 In the kit there are two apple blossom designs and two pieces of taffeta fabric so that you can work both designs. 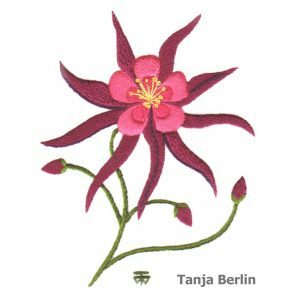 I provide a detailed instruction booklet with 21 pages of step-by-step diagrams and instructions on how to work each stitch which are reversible so that the back looks the same as the front. 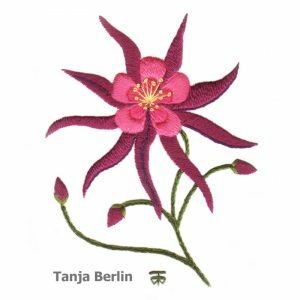 The Blossom Branch is a 2-sided hand embroidery technique. 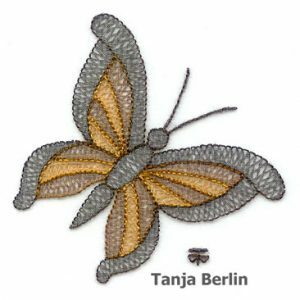 The design is worked in surface embroidery stitches on a taffeta fabric using DMC No. 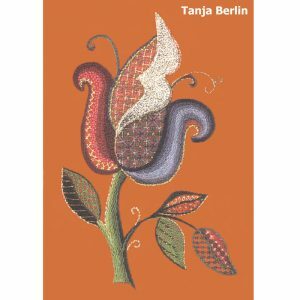 8 Perle cotton thread. 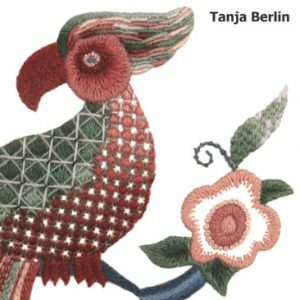 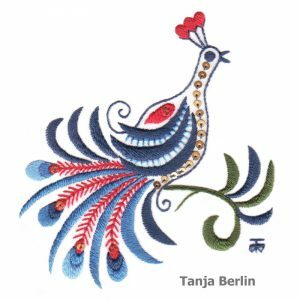 The Jacobean Bird is for all levels of embroiderers. 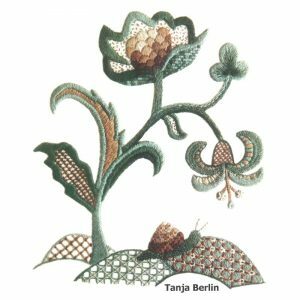 The design uses traditional Jacobean motifs and is stitched in 14 traditional Jacobean colours in Appleton crewel wool on traditional linen twill fabric. 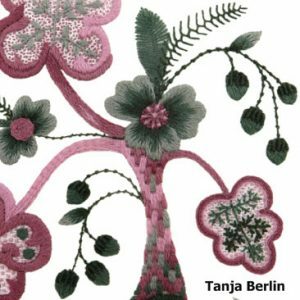 The design comes drawn on the fabric so you do not have to be concerned about transferring the design yourself. 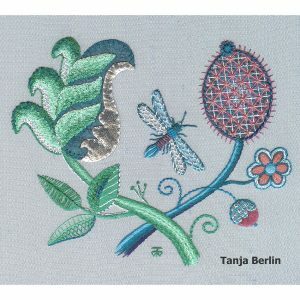 There are 20 surface embroidery stitches worked on in a single strand of the crewel wool for each stitch on the design. 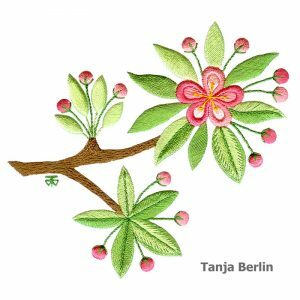 The Jacobean Tree is for all level of embroiderers. 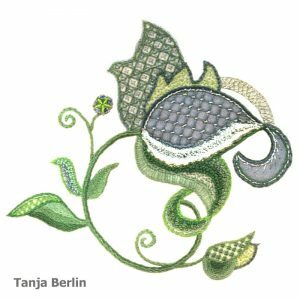 The design uses traditional Jacobean motifs and is stitched in 6 traditional Jacobean colours in Appleton crewel wool on traditional linen twill fabric. 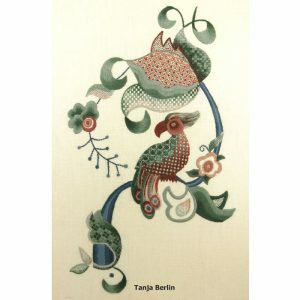 The design comes drawn on the fabric so you do not have to be concerned about transferring the design yourself. 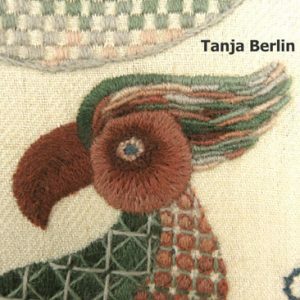 There are 23 surface embroidery stitches worked in a single strand of the crewel wool for each stitch on the design. 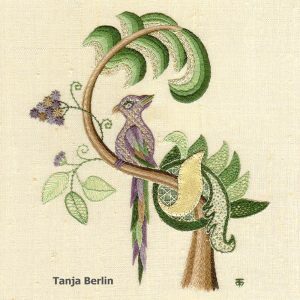 The Jacobean Tree with Bird is an advanced crewel surface embroidery technique. 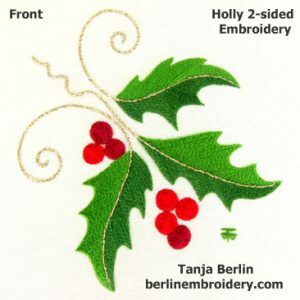 If you are new to the technique you may want to try a smaller design first as this design is large and will take some time to stitch. 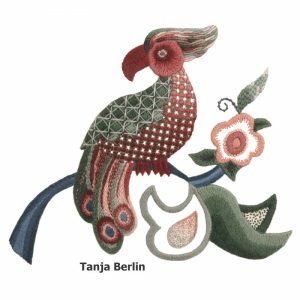 The design uses traditional Jacobean motifs and is stitched in 14 traditional Jacobean colours in Appleton crewel wool on traditional linen twill fabric. 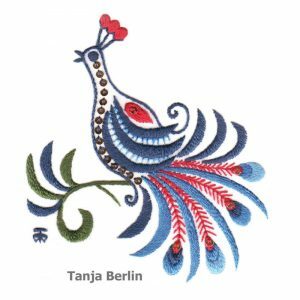 The design comes drawn on the fabric so you do not have to be concerned about transferring the design yourself. 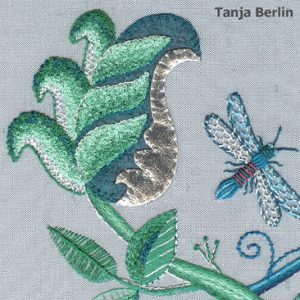 There are 22 surface embroidery stitches worked on in a single strand of the crewel wool for each stitch on the design. 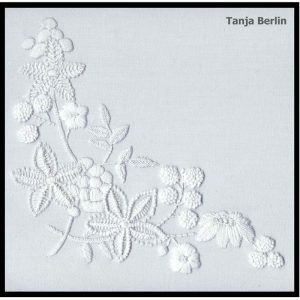 The Mountmellick Corner Design is an Irish white work hand embroidery technique in which heavy white cotton threads are used to work surface embroidery stitches creating a floral design on a heavy cotton satin jean fabric, which has a smooth and satin surface. 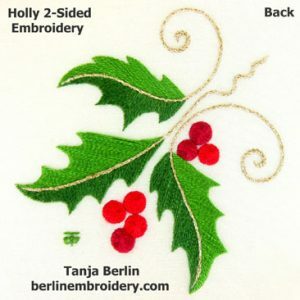 This is a great technique for any level of stitcher as the stitches are easy to work, there are 15 different surface embroidery stitches on the embroidery. 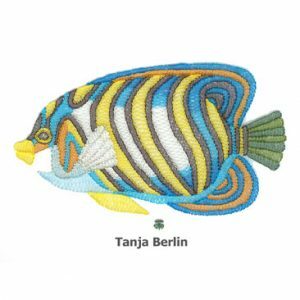 The Shadow Work Angel Fish is an intermediate surface embroidery technique. 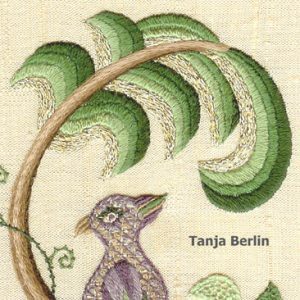 The shadow work embroidery is made up of bands of herringbone stitch at the back of the fabric that show through at the front as a shadow of colour. 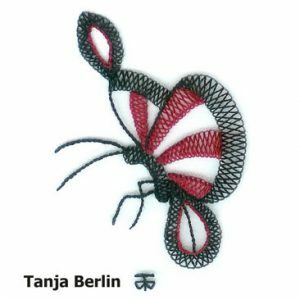 I have designed my shadow work embroideries as pieces of art. 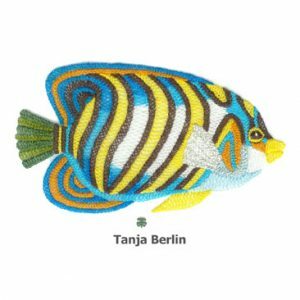 The angel fish looks lovely mounted between two window mat boards and hung from the corners like a mobile so that both sides of the embroidery can be seen and makes a great bathroom decoration. 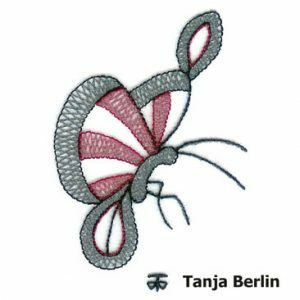 The Shadow Work Butterfly is a beginners surface embroidery technique. 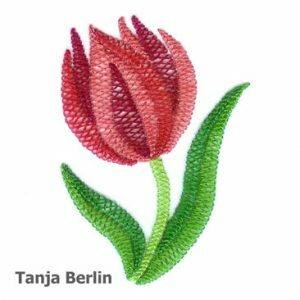 The shadow work embroidery is made up of bands of herringbone stitch at the back of the fabric that show through at the front as a shadow of colour and is a simple form of 2-sided embroidery. 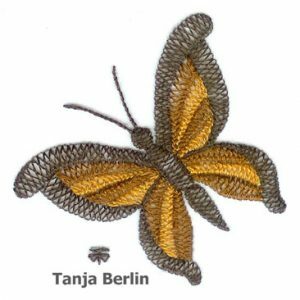 The shadow work embroidery is made up of bands of herringbone stitch at the back of the fabric that show through at the front as a shadow of colour and is a simple for of 2-sided embroidery. 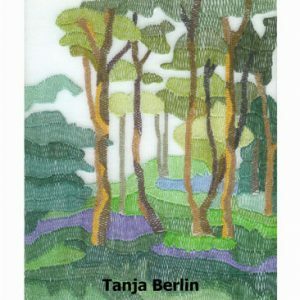 The Shadow Work Forest is an intermediate surface embroidery technique. 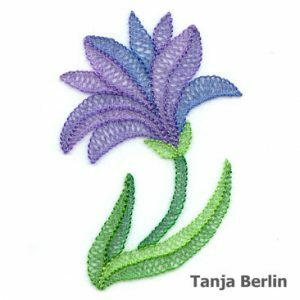 The Shadow Work Iris is a beginners surface embroidery technique. 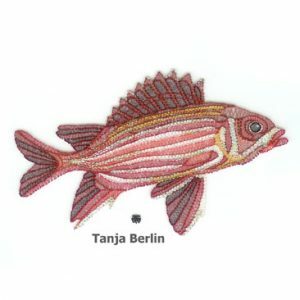 The Shadow Work Squirrel Fish is an intermediate surface embroidery technique. 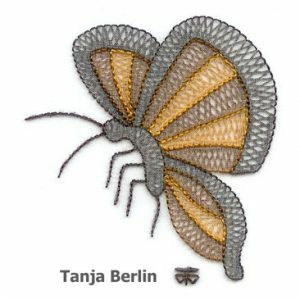 I have designed my shadow work embroideries as pieces of art. 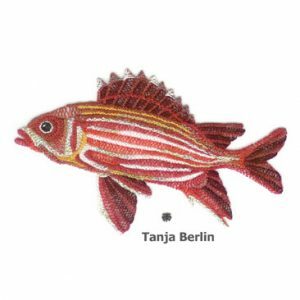 The squirrel fish looks lovely mounted between two window mat boards and hung from the corners like a mobile so that both sides of the embroidery can be seen and makes a great bathroom decoration. 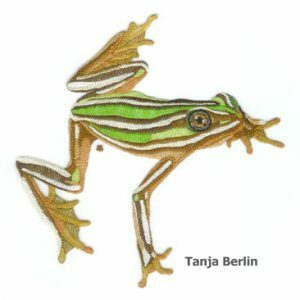 The Shadow Work Tree Frog is an intermediate surface embroidery technique. 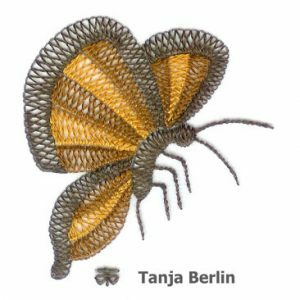 I have designed my shadow work embroideries as pieces of art. 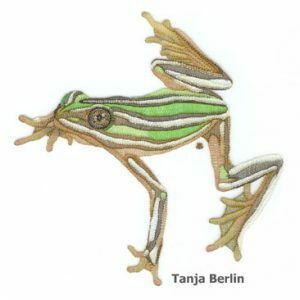 The tree frog looks lovely mounted between two window mat boards and hung from the corners like a mobile so that both sides of the embroidery can be seen. 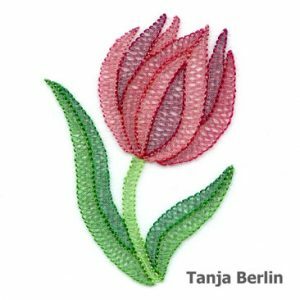 The Shadow Work Tulip is a beginners surface embroidery technique. 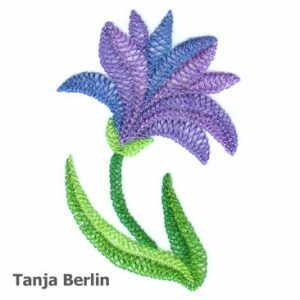 The Tropical Flower is a 2-sided hand embroidery technique. 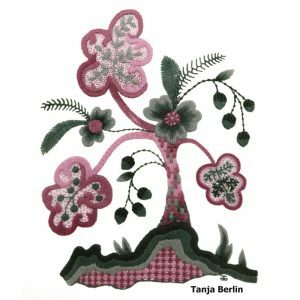 The design is worked in surface embroidery stitches on a silk Dupioni fabric using Au Ver A Soie, Soie D’alger silk thread. 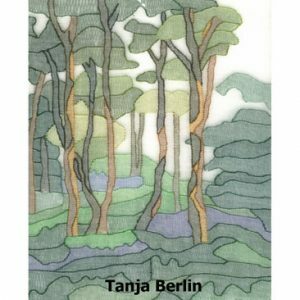 In the kit I provide a detailed instruction booklet with 15 pages of step-by-step diagrams and instructions on how to work each stitch which are reversible so that the back looks the same as the front.